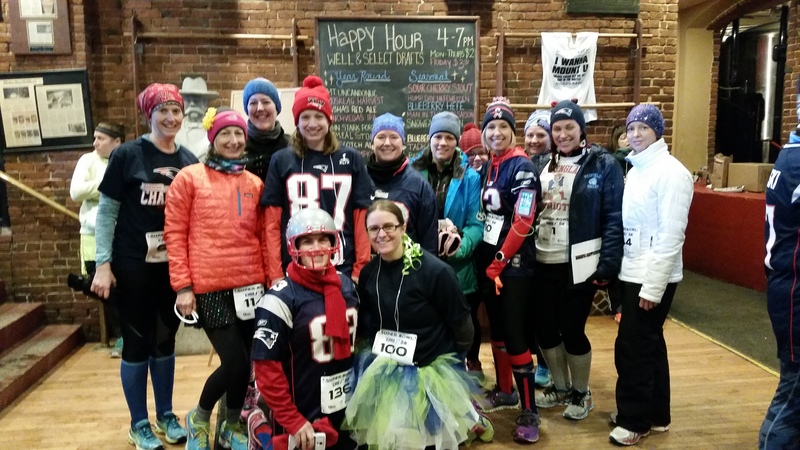 Yesterday morning several running buddies and I donned our favorite football team’s gear, headed downtown, and attempted to stay warm while running the Super Bowl “Chili” 5k. 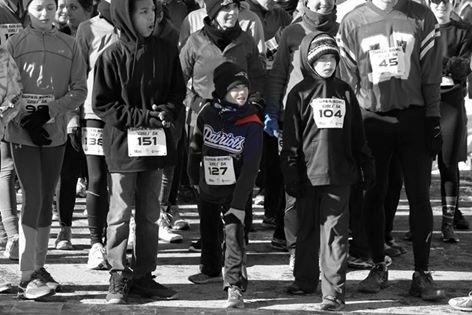 This was my first time running this race, and I am still pretty new to winter racing. So when I saw the cold temps forecasted I was pretty nervous. I have participated in some other TI Event races, and have found them to be well run, with fun after parties. I found this race to live up to these expectations. The company is relatively new, and specializes in charity events. 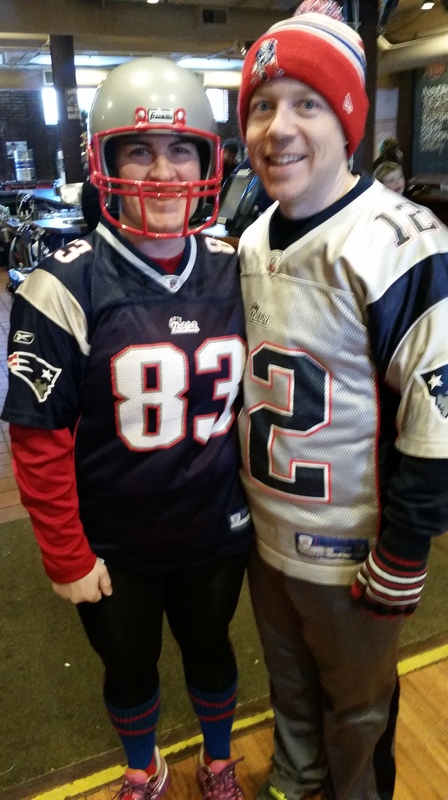 My friend Erin and her hubby ready to earn their chili! Organization: The event was well organized. I arrived an hour prior to start time and had no trouble getting a good parking spot, right in the Milly’s lot. Bib pickup went quickly and smoothly. We were able to hang out and stay warm inside Milly’s before start time, and to use their bathrooms, for which I was greatly appreciative. 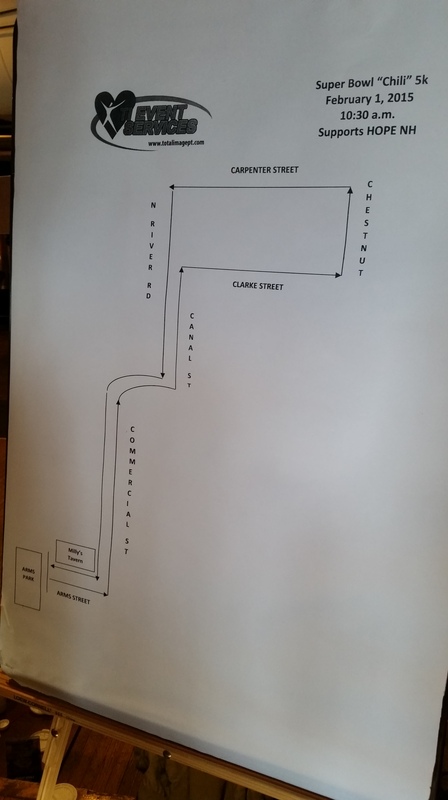 There was a large course map on display and plenty of water and bananas, as well as Dunkins coffee, for the runners. 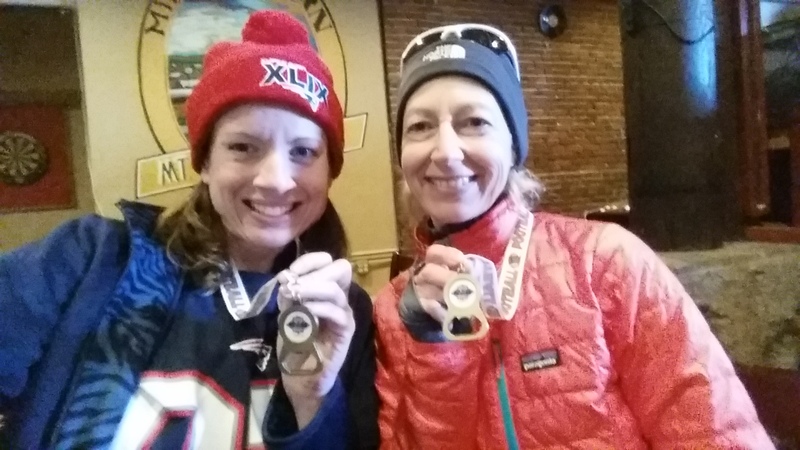 My friend Donna Sarasin and I. Loving our medals! Swag: The first 100 registrants received a keepsake beer glass. The top 2 runners got a cash prize of $100. Top 2 finishers of each division got a very cool medal/bottle opener. I was very excited to receive one! Only the second time I’ve ever placed, so it’s still a big thrill for me. And I love it. All registrants age 21 or over get to chose one free beer at the Milly’s after party. Excellent selection. Blueberry pumpkin with a brown sugar rim was a popular choice. Every runner got a free bowl of chili. Courtesy of TI Events: Ready to run! The Course: The first half of the course was mostly uphill. Or at least it felt that way. Lots of slow, steady inclines. Combined with the biting cold (it was a balmy 16 degrees at race time) and wind this made for some tough going. The course was very well marked, with both signs and plenty of volunteers directing us. The roads weren’t shut down, but it was a small race, and not too much traffic this time of day. There were plenty of traffic cops at the busier intersections as well. There was a water stop at the half way point. The second half was much easier for me. Partly because I had warmed up by then, and partly because we got some great downhill from then on. Ultimately I really enjoyed the run, and was proud of myself for getting the time I did (26:48) on what I considered a fairly challenging course on such a cold day. The After Party: The after party was at Milly’s. The Milly’s staff was very gracious. There was a DJ and award ceremony. Times were posted for us on a board by the entrance. As a vegetarian I did not get to partake of the chili. From what I saw it looked good, but the dishes were pretty small. I hoped for some bread or crackers but there weren’t any. So I ordered from the Milly’s menu, which was a sinfully yummy selection and reasonably priced. Many other runners ended up ordering food as well. We all had a fun time, and it was a great way to kick off Super Bowl Sunday, and February. I was also pleasantly surprised to receive both results and race photos via email later that afternoon. The results email even featured my finish line picture. Very cool touch. Overall I’d say this was an excellent race. I had a blast and would definitely run it again, and recommend to friends as well. It had the uncommon race experience of being both small and laid back but also professionally run and organized. Usually in the race world you get one or the other but I have found this to be characteristic of TI Events. On another note: Go Pats!!!!! Congrats on another Super Bowl win!!! !